Baked beans are a great food for filling up little tummies with healthy goodness. They’re packed full of protein and are considered one of your 5 a day. When you’re baby led weaning though they can be tricky for little one to pick up and get into their mouth. They slide off toast and through fingers far too easily. 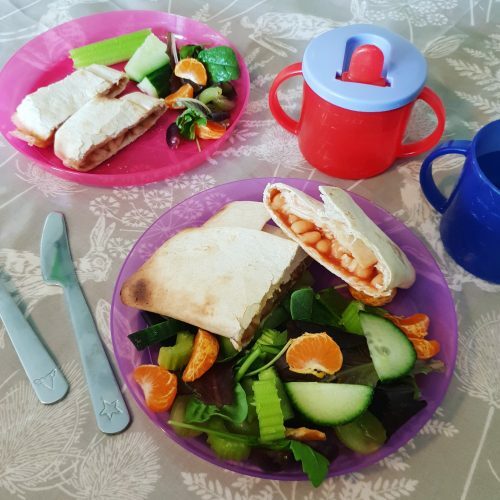 The cheesy bean wrap is a great alternative to beans on toast and is so much easier for baby to pick up and feed themselves! I cut this into strips for my 7 month old and, about the same length as my finger, and just cut it in half for my 2 year old. I served it with a small salad and it was perfect for the three of us to enjoy together as a quick, easy, healthy lunch. There were clean plates all round which is a definite mum win in my book! Lay the wrap on a baking tray. Warm the beans in the microwave for 1 minute. Spoon the beans down the centre of the wrap, leaving space around all edges. Sprinkle the cheese over the beans. Fold the wrap so the beans are completely covered and can’t escape. Turn the wrap over so the folded side is facing down and cook under the grill for 1-2 minutes, until crisp and golden. Flip the wrap so the folded side is up and return under the grill for a further 1-2 minutes. Cut in half, allow to cool (it will be very hot) and enjoy!